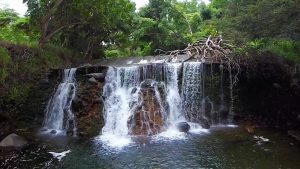 WAILUKU, MAUI – The Commission on Water Resource Management will be performing work on the waterfall at the Waihe‘e Ditch siphon where it crosses Wailuku River*. The Commission has asked Wailuku Water Company, LLC (WWC) to reduce the amount of water to Wailuku River, in order to perform the work and provide a safe work environment. The Commission is performing the work under a grant from the U.S. Fish & Wildlife Service to improve habitat and migratory pathways for native stream fauna. Native Hawaiian ‘o‘opu (fish), ‘opae (shrimp), and hihiwai (snails) depend on the connectivity of habitat between headwater streams and the ocean and have evolved the ability to climb wet rocks and up waterfalls. However, an overhanging concrete lip at the top of a naturally occurring waterfall on the Wailuku River limits their upstream migration. The purpose of the project is to repair the overhang section with grouted rocks from the stream to ensure habitat connectivity. A portion of the stream will also be diverted with sandbags for worker safety. The tentative start date is Monday, August 8, 2016. On this date, WWC will divert a portion of the flow of the Wailuku River at the upper diversion. This work is expected to take about 2 weeks and will be subject to the availability of supplies, work completion, and weather conditions. During this time, the interim in-stream flow standard (IIFS) release of 10 million gallons per day (mgd) near the Hawai‘i Nature Center will be temporarily suspended. After completion, water will be returned to the stream to meet the IIFS at Kepaniwai Park. This information will be posted on the Commission website (http://dlnr.hawaii.gov/cwrm). *Attached: photo of the waterfall in Iao Stream, since renamed Wailuku River, courtesy Bob Horcajo.